Sgt. Brady A. Beach, a Sioux City resident serving with the Iowa Army National Guard’s Detachment 2, Headquarters and Headquarters Company, 1st Battalion, 168th Infantry based in Spencer, is presented the Army Achievement Medal by the Iowa Army National Guard’s Deputy Commanding General Steve Altman and State Command Sergeant Major Rachel Fails. The Iowa Army National Guard’s finest warriors gathered at the Camp Dodge Joint Maneuver Training Center March 20-22, 2015 to compete in the annual Best Warrior Competition. The three-day competition tested the Soldiers’ physical, mental and professional skills. Eleven privates first class and specialists competed for the Soldier of the Year title, while 13 sergeants and staff sergeants competed for Non-Commissioned Officer of the Year honors. These Soldiers, representing the Iowa Army National Guard’s four major commands, were tested on physical fitness, marksmanship, written exam and essay, an appearance board, day and night land navigation, drill and ceremony, Warrior Tasks and Battle Drills, confidence course obstacles, and a 12-mile march with rucksack. The Iowa Army National Guard’s Deputy Commanding General (Maneuver), Brig. Gen. Steve Altman, and State Command Sergeant Major, Command Sgt. Maj. Rachel Fails, presented the awards in front of 150 Soldiers and family members on the final day of competition. 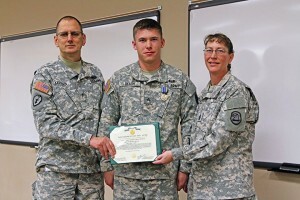 In the Soldier of the Year category, Spc. Derek G. Accola, of Ames, from the 186th Military Police Company based in Johnston, took first place. The second place finisher was Pfc. Dakota VanBrocklin, of Dubuque, from the 134th Medical Company, Johnston. Spc. Derek G. Accola, an Ames resident serving with the Iowa Army National Guard’s 186th Military Police Company based in Johnston, took first place in the Iowa National Guard’s Best Warrior Soldier of the Year competition. 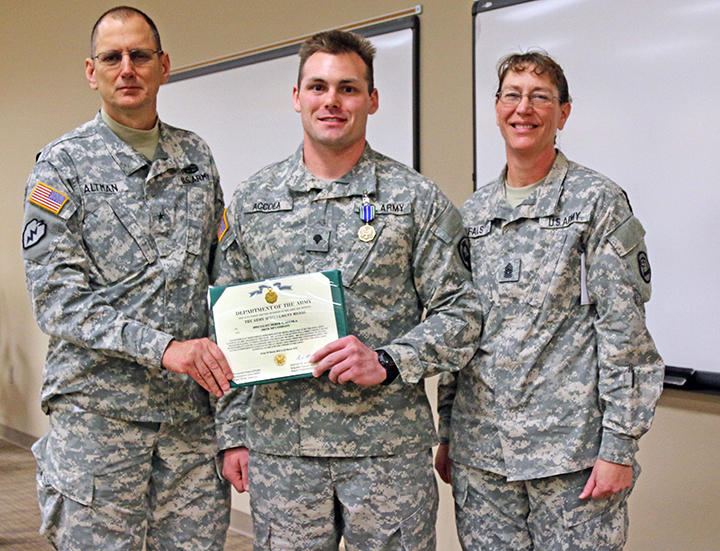 Here, he’s presented the Army Achievement Medal by the Iowa Army National Guard’s Deputy Commanding General Steve Altman and State Command Sergeant Major Rachel Fails. The Non-Commissioned Officer of the Year winner was Sgt. Brady A. Beach, of Sioux City, from Detachment 2, Headquarters and Headquarters Company, 1st Battalion, 168th Infantry, based in Spencer, with Staff Sgt. Andrew Johnson, of Cedar Falls, from Joint Forces Headquarters, Johnston, finishing second. The Iowa winners now move on to compete at Camp Atterbury, Ind. in the Region 4 contest May 11-14. The regional competition consists of Army National Guard state winners from Iowa, Wisconsin, Minnesota, Illinois, Indiana, Ohio and Michigan.